A vast corrie consisting of several distinct areas, offering a mixture of graded gullies and big steep slopes, on different aspects. 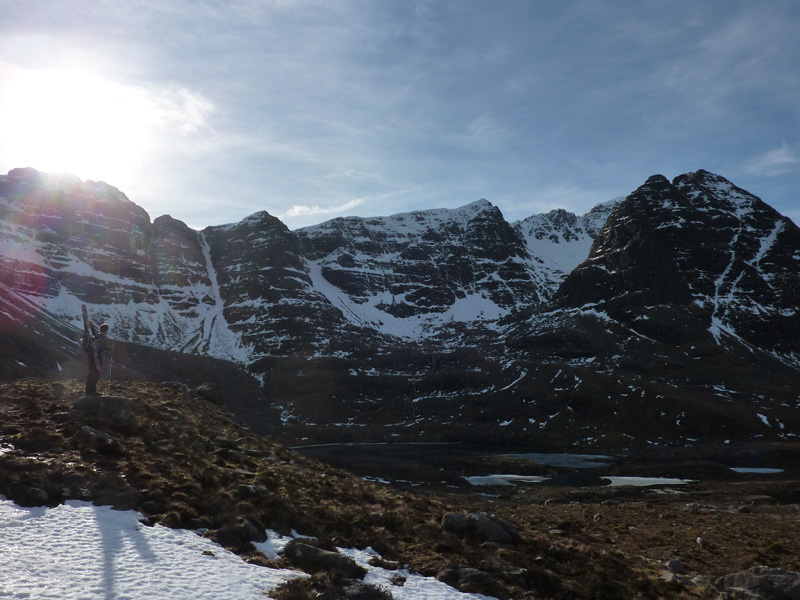 As with Coire Dubh Beag and Coire Dubh Mor, the best option is to park at the Coire Dubh car park (NG 957 568), and follow the excellent path up the glen to the watershed. 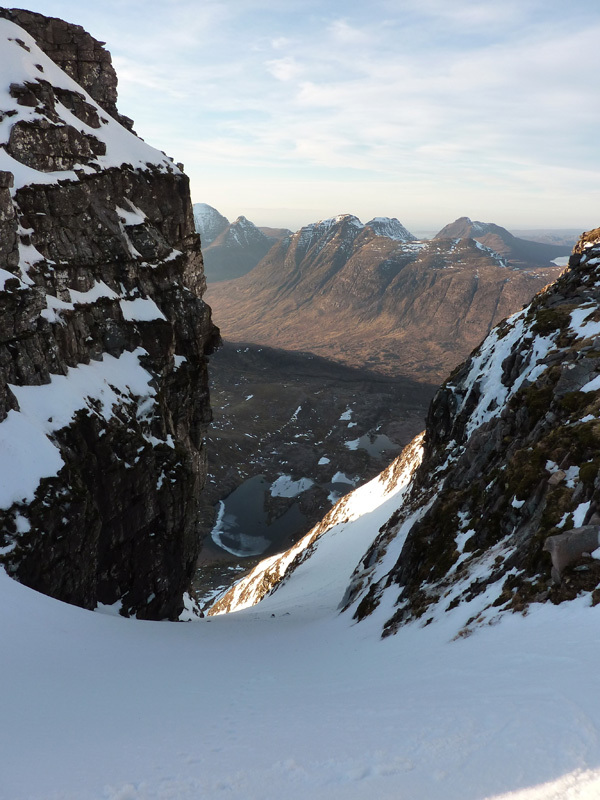 If you have reached the point where the path forks (the left fork heads west down the glen between Liathach and Beinn Dearg - the right fork skirts the base of Sail Mhor and ends up in Coire Mhic Fhearchair on Beinn Eighe), then you have gone a little too far. From the highpoint of the path, you need to skirt below both Coire Dubh Beag and Coire Dubh Mor. 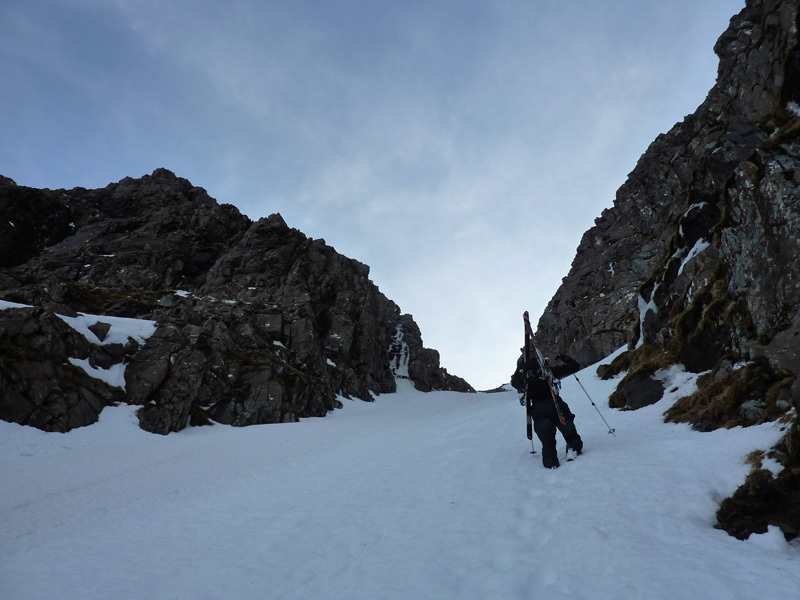 It is best to aim to pass below a small prominent flat topped nose of rock, which is located below the buttress between Coire Dubh Beag and Coire Dubh Mor. Without snowcover, the ground is rough with heather and bouldery hollows, but doesn't take too long - about 2hrs 30 minutes to the bottom of Am Fasarinen, for example. 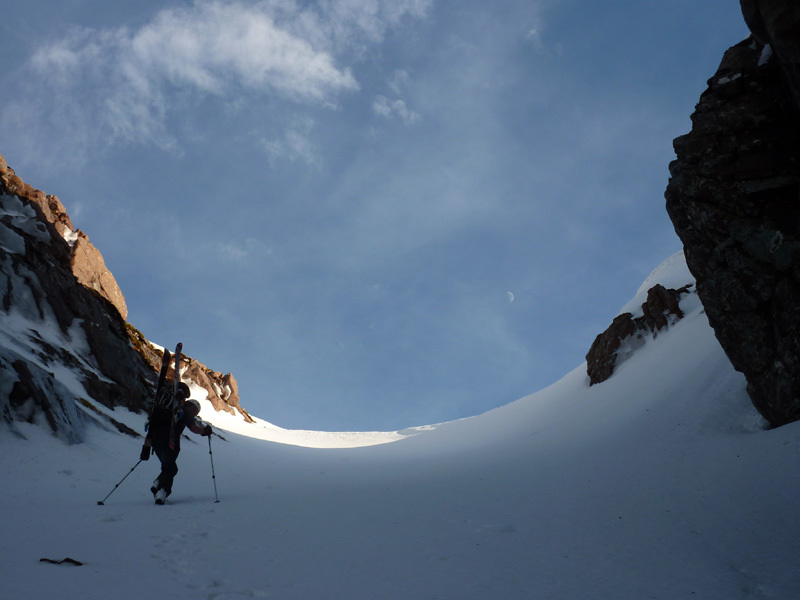 If you are aiming for the Am Fasarinen side of the corrie, it is advisable to traverse the west facing slope of Spidean a' Choire Leith (assuming snow conditions allow), aiming for the left hand side of the large obvious mass of boulders below the cliff. It's best avoided if you can help it! The corrie is wide and has several distinct sections. On the left (East), is Spidean a' Choire Leith, and the ridge to the west is Am Fasarinen, a complex section of the ridge that involves some easy technical climbing to traverse. Near the left hand side is the prominent left leaning triangle of rock, known as "The Dru". Several gullies drop from the ridge. Am Fasarinen is bounded on the right hand side by a terraced buttress than drops low into the corrie from the spot height 903m. 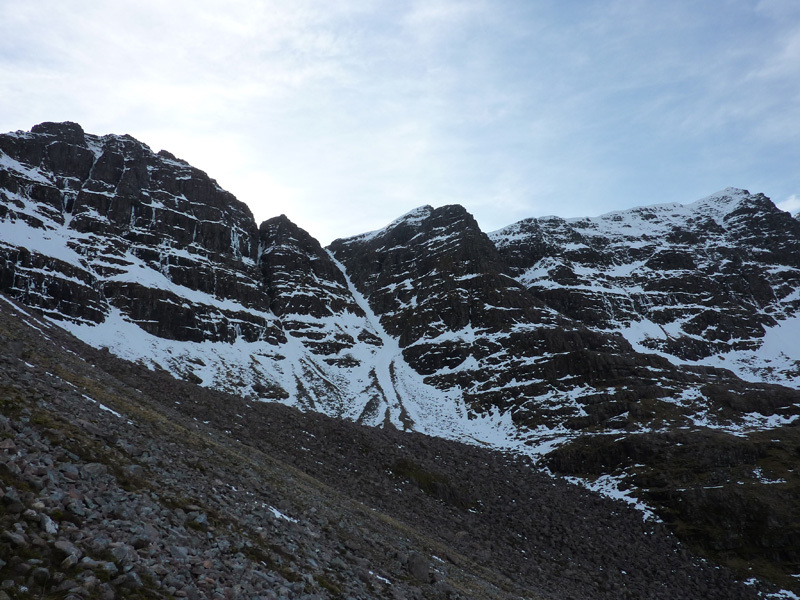 The buttress has grade I gullies descending either side of it (Gully 7 and Gully 8). Gully 7 is the wide, straight, most obvious gully in the corrie. 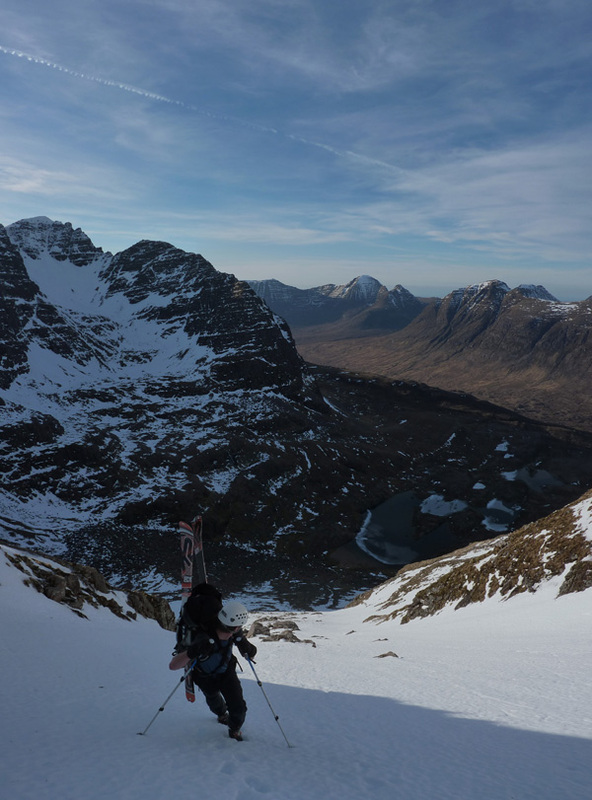 To the right of the terraced buttress, is the upper corrie below Mullach an Rathain. A large buttress (Bells Buttress) gives way to big slopes below the summit. This side of the corrie curves round, with another section of technical ridge, the northern pinnacles of Meall Dearg. There are some short gullies descending from high up on the ridge. I haven't done these yet, but they will hopefully get investigated as some point. The slanting line of No. 2 Gully looks perfectly skiable, It cuts across the cliff towards the base of No. 1 Gully. It starts out as a gully, then becomes a ramp line above an icy slab - not a place to have a fall. Gully 5. This short Grade I is located to the West of the prominent pinnacle, nicknamed "The Dru". Gully 8. I haven't looked into the top of this yet, but the upper gully looks short, followed by a big slope into the west side of the corrie. Looks good. Gully 7 is the obvious straight gully line that you see as you round the corner of the corrie from the East. It is just left of a prominent buttress, the top of which is marked as a spot height of 903m on OS 1:50000 maps. The gully is wide and straight, and fairly uniform in gradient. The very top of the gully may be rubble, preventing a complete descent from the ridge, but that aside, it is definitely worth doing. 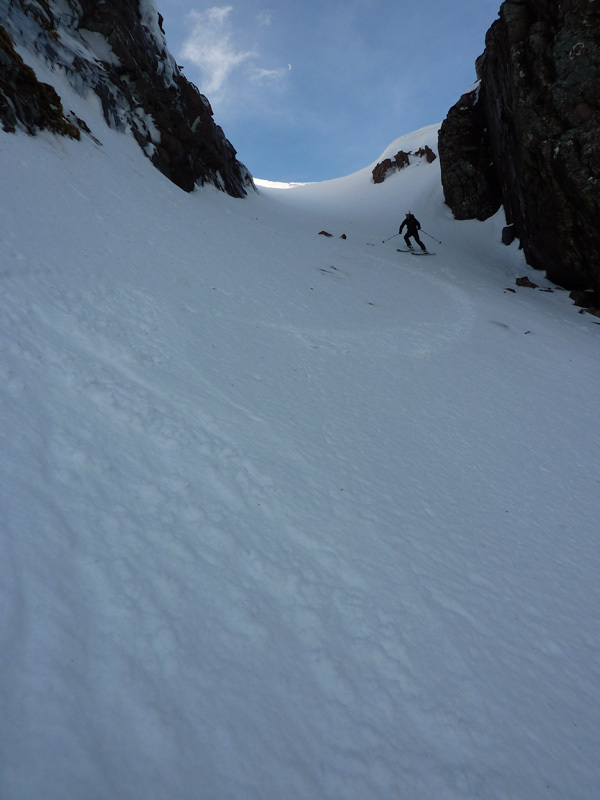 Tucked high up on the East side of Coire Na Caime, No.1 Gully is a short, but wide corridor that sits above a large West facing slope. It is hidden on the approach from the East until you are below it. 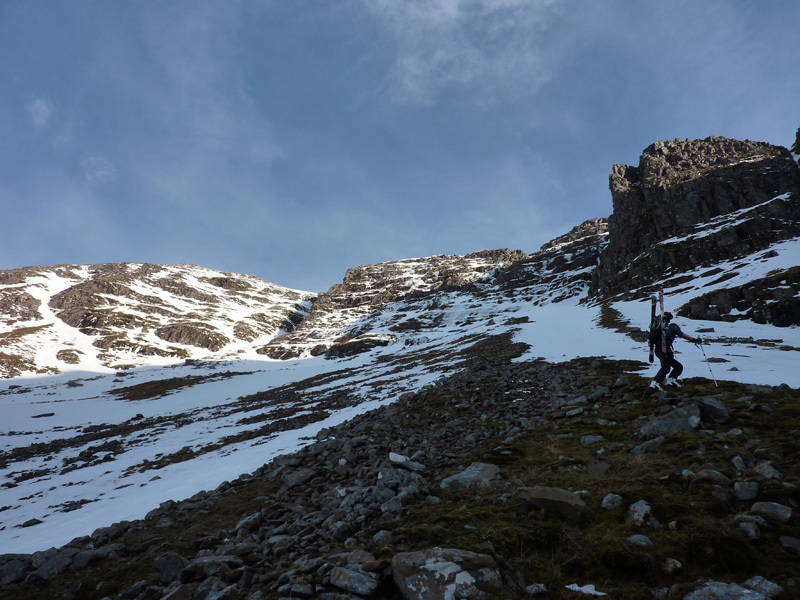 The gully leads to a small col just to the West of Spidean a' Choire Leith. The descent is quite straightforward, being wide and of fairly uniform gradient. 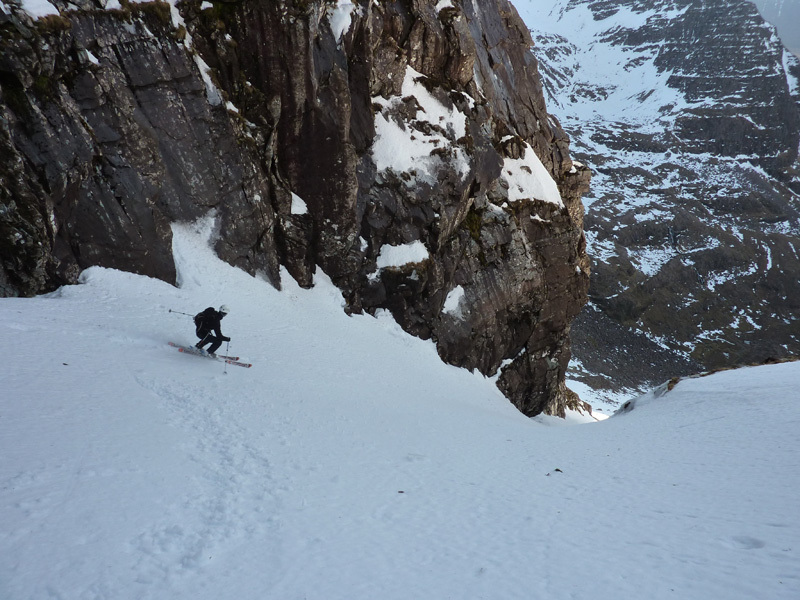 It is however, a stunning ski, as you have an amazing outlook over the lochan way below to Beinn Alligin and Beinn Dearg. In lean conditions, an area of boulders may sit bare in the middle of the upper section of the gully. 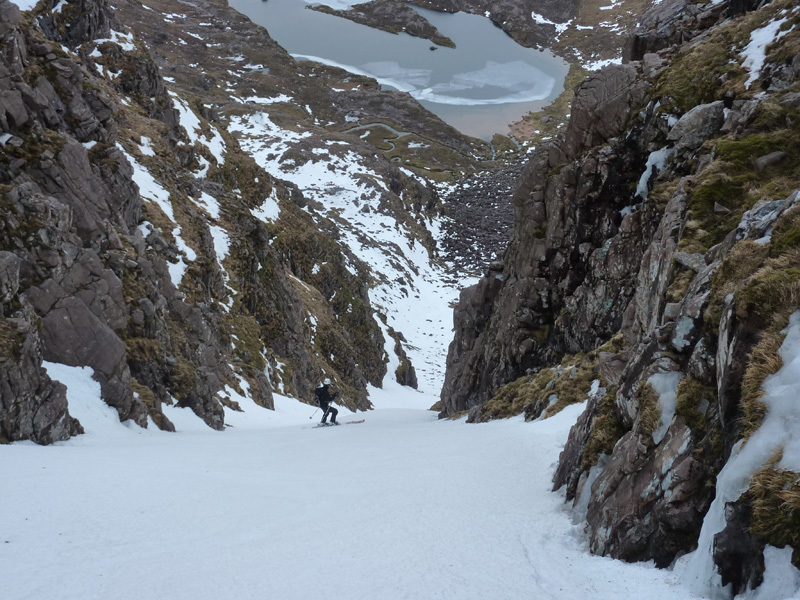 The Westernmost lobe of Coire na Caime has multiple possible descent options. Rather than detail them all individually, 3 lines are described. Towards the col, there are several more amenable lines, and the build up of snow will determine what looks best, but the line marked "Col Line" holds the most snow and is a pleasant ski. 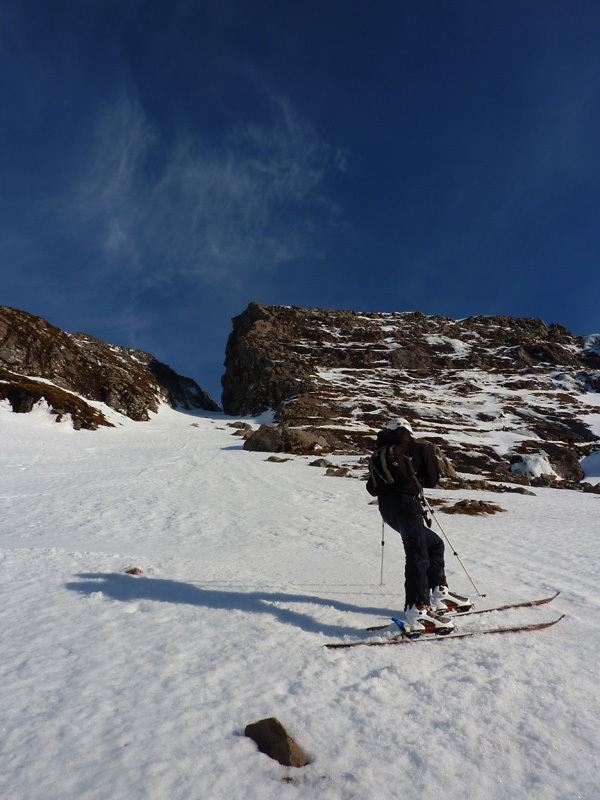 The upper corrie holds snow well, so this is a relatively reliable location to ski, even late in the season. Notes: Grade I ground for the first 100m of vertical, then eases.